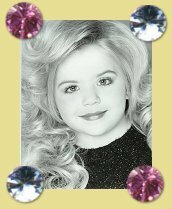 My name is Rhonda Moffitt, I have been the National Director for Diamond Girls since February 2000. I would like to welcome each and everyone of you to our website. Please take a moment to browse our site to see what we have to offer! 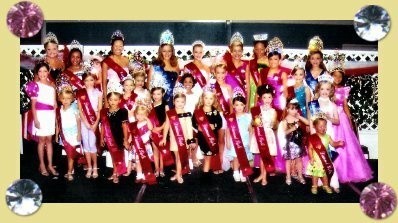 I have extensive pageant experience, 28 years ongoing, I have been competitor, Director, and Pageant Mom . 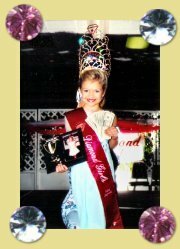 I believe Pageantry is a great way for building self esteem. 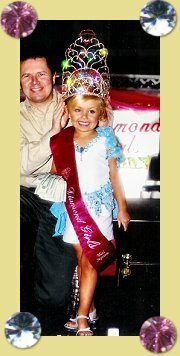 We pride ourselves in crowning every contestant, because they all are a true winner that day. No matter if they won the title that they wanted that day or who won the bigger crown. The responsibility behind the crown is much more important. Showing self confidence and your willingness to set and accomplish anything you set your mind to never-ever quitting because if you know you are a "WINNER" then my friend you have "WON" much more than any pageant, sport, or competition can give you. REACH FOR THE STARS & HAVE FUN! LOOK FORWARD TO MEETING YOU AT THE NEXT UPCOMING EVENT! THE "2004" ONE IN A MILLION LIGHTED CROWN AS YOU READ THIS VERY MOMENT THE CROWN IS IN MAKING AT THE FACTORY AND WILL BE ARRIVING SOON! SO KEEP CHECKING BACK. THIS IS SOMETHING YOU HAVE GOT TO SEE! IT IS GORGEOUS, THERE IS NO OTHER CROWN AROUND LIKE THIS ONE! IT IS HUGE & LIGHTS UP, ENHANCED WITH RUBY & AMETHYST COLORED STONES EMBELLISHED WITH CHUNKS OF AB STONES THAT LIGHTS UP WITH REAL LIGHTS! Design �Stacey Stewart All Rights Reserved.